Alex Cora unloads some of the 10 tons of relief supplies sent to his native Puerto Rico. 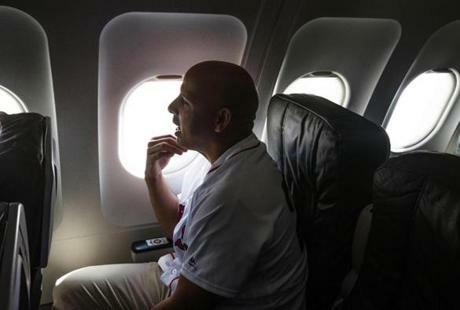 CAGUAS, Puerto Rico — As the Red Sox/JetBlue charter flight loaded with relief supplies for Puerto Rico was zooming down the snowy Logan Airport runway, its wings still dripping with de-icer and a stormy ocean visible out the window, that’s when the thoughts of manager Alex Cora thoughts turned to Roberto Clemente. Clemente, the Pirates Hall of Fame right fielder, perished on a similar mission. On New Year’s Eve 1972, his chartered plane carrying aid for the victims of a Nicaraguan earthquake crashed after takeoff from his native Puerto Rico. His body was never recovered from the ocean. Alex Cora led the Red Sox’ relief efforts to his native Puerto Rico. To Cora, this mission is more important than Opening Day. Last season, he won a World Series with the Houston Astros as bench coach, but he also lived through hell. “I lived through [hurricanes] Harvey and Maria on a team that was the best in baseball, and for a good amount of time every day, baseball was secondary,” he said. “We came down on our knees for a moment. The relief mission was so important, in fact, that it was the deciding factor before Cora signed with the Red Sox. Cora’s family, including twin boys born last July, was on the island when Maria hit in September, and communication was temporarily lost. “It was the longest morning of my life,” said Cora. 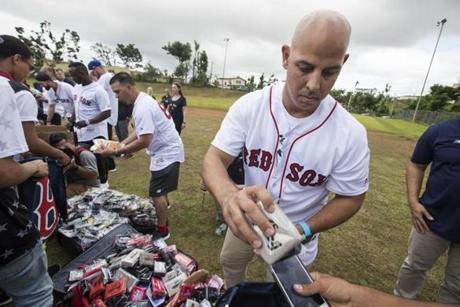 Alex Cora and other team representatives distributed baseball supplies. Everyone in his family was safe, but some neighbors’ homes were destroyed. Cora’s hometown of Caguas is 20 miles south of San Juan. A sector known as La Mesa still does not have electricity. Things have been slow to improve. But he did not want to address questions about President Trump’s aid. “We need love right now,” he said. 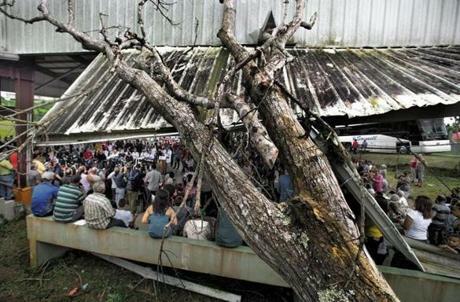 The Red Sox used the La Mesa Sports Complex, an open-air basketball court with a corrugated roof that still has a toppled tree breaking through it, to distribute supplies and cheer the locals. The damaged La Mesa Sports Complex. Several JetBlue cargo jets have delivered almost 10 tons of supplies to Puerto Rico. Tuesday’s flight included medical supplies, water filtration systems, first aid kits, flashlights, diapers, food, and water. Cora, Kennedy, Boston Mayor Marty Walsh, and Red Sox pitcher Rick Porcello were aboard this flight. Red Sox catcher Christian Vazquez, pitcher Chris Sale, and Puerto Rican officials met them at Luis Muñoz Marín International Airport in San Juan. At La Mesa, it was a love fest. 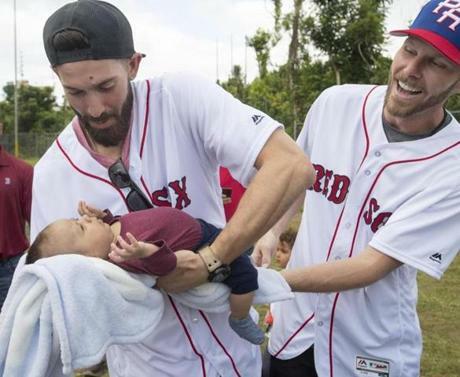 Sale held babies gently — the opposite of how he throws fastballs — and Walsh bagged supplies as if he were a teenager working at a Dorchester Stop and Shop. Then after bagging, he carried them out for the elderly. The Red Sox Foundation wrote a check for $200,000 to help bring back electricity. Red Sox pitchers Rick Porcello and Chris Sale were among the team representatives. The new Red Sox manager is taking a hands-on approach to helping his homeland. Daniel Boschetti, program director of Milagros para Ninos (Miracles for Children) at Children’s Hospital, had $50,000 worth of vaccines for Puerto Rico but no plane. He contacted Cora, who helped arrange the transport. “He’s the real deal,” said Boschetti. 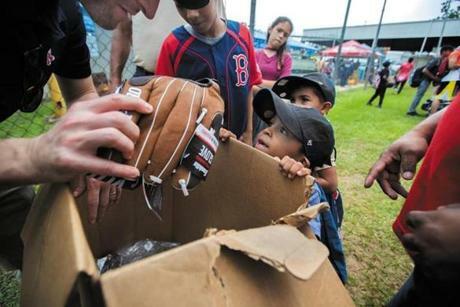 An excited young boy in Caguas received a new baseball glove. Cora reminded children to tell their parents that they love them. Cora’s father died of colon cancer when he was 13. On this trip, his mother Iris, a huge baseball fan, hugged him and wept with joy. “She was proud of me and of all the Red Sox that came here,” said Cora. At the end of this joyous afternoon, a small patch of a rainbow appeared high above center field at the sports complex. “Today was a special day,” said Cora. “To see the faces of the people was amazing and very gratifying. But this is just the beginning. We have more work to do. A native of Caguas is all smiles after receiving a Red Sox care package.